The Super Sprouter® Clear Cut Dome uses ultra-clear plastic to maximize light penetration for your starts. 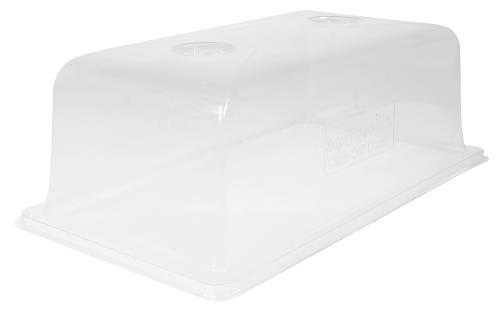 The Clear Cut Dome includes dual top vents and a custom designed locking mechanism in each corner that allows you to secure the dome onto a Clear Cut Tray (726448). This makes these components portable as well as providing a stable environment for humidity control. The final piece to the set is the Clear Cut Insert (726444). This clear insert allows you to look at your starts for roots by simply lifting the insert to view all your starts at once, avoiding direct handling. The Clear Cut Insert makes the perfect nesting spot for Grodan® A-OK Starter Plugs (713025 and 713030). Viewing your starts is clear now with the Super Sprouter® Clear Cut System.